Blouse: Black velvet sleeveless blouse top has scattering sequins shower. Hidden zipper at back. 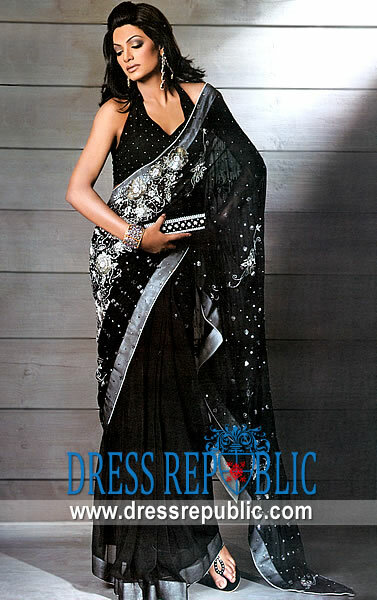 Saree: Scarlet red self-textured jamawar Saree has stunning black floral and silver work on pallu, and hemline. 2 inch wide heavy embellished border all around. 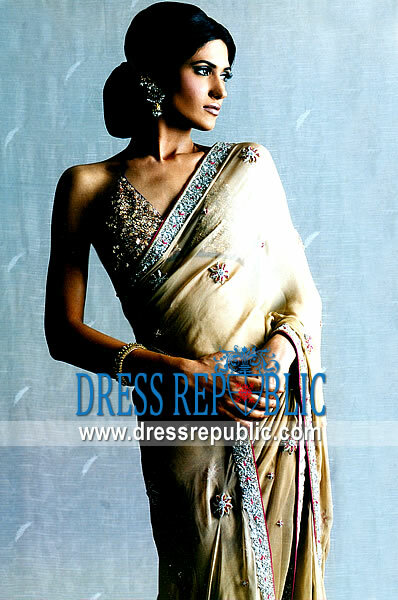 Big crystal rhinestones studding along with small Swarovski crystals making the Saree glittering and high-fashion. Draped and stitched with belt for easy wear. Comes with a petticoat. Piping edges finish. Embellishments made with sequins, beads, kora, dabka, cut-glass, rhinestones, Swarovski crystals, pearls, kamdani and marorri. 100% natural pure fabrics. All handmade embellishments. 100% same as shown. Hemming finish.